The Jupyter Notebook is an open-source web application that allows you to create and share documents that contain live code, equations, visualizations, explanatory text and direct controll or monitor hardware. Uses include: data cleaning and transformation, numerical simulation, statistical modeling, machine learning and much more. In-browser editing of code, with automatic syntax highlighting, indentation, and tab completion/introspection. The ability to execute code from the browser, with the results of computations attached to the code which generated them. Displaying the result of computation using rich media representations, such as HTML, LaTeX, PNG, SVG, etc. For example, publication-quality figures rendered by the matplotlib library, can be included inline. Notebook documents contains the inputs and outputs of a interactive session as well as additional text that accompanies the code but is not meant for execution. In this way, notebook files can serve as a complete computational record of a session, interleaving executable code with explanatory text, mathematics, and rich representations of resulting objects. These documents are internally JSON files and are saved with the .ipynb extension. Since JSON is a plain text format, they can be version-controlled and shared with colleagues. Notebooks may be exported to a range of static formats, including HTML (for example, for blog posts), reStructuredText, LaTeX, PDF, and slide shows, via the nbconvert command. Furthermore, any .ipynb notebook document available from a public URL can be shared via the Jupyter Notebook Viewer (nbviewer). This service loads the notebook document from the URL and renders it as a static web page. The results may thus be shared with a colleague, or as a public blog post, without other users needing to install the Jupyter notebook themselves. In effect, nbviewer is simply nbconvert as a web service, so you can do your own static conversions with nbconvert, without relying on nbviewer. 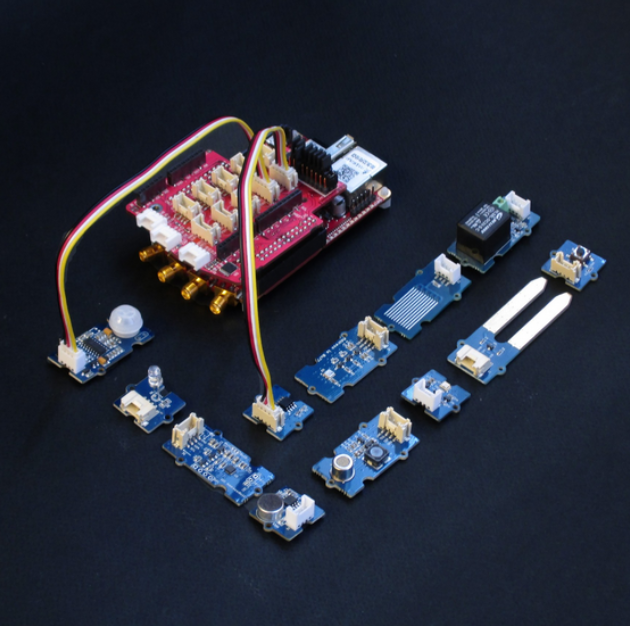 Although the usage of Jupyter notebook does not require any additional hardware except the STEMlab board, getting started with electronics is way more fun and interesting when you have loads of sensors that you can put to good use straight away. Whether you want to measure temperature, vibration, movement etc. we have an extension module compatible with Grove modules from Seeed®. All you need is to select the desired module, find the correct connector and get going with your project. We have also placed Arduino shields headers on the Extension module. 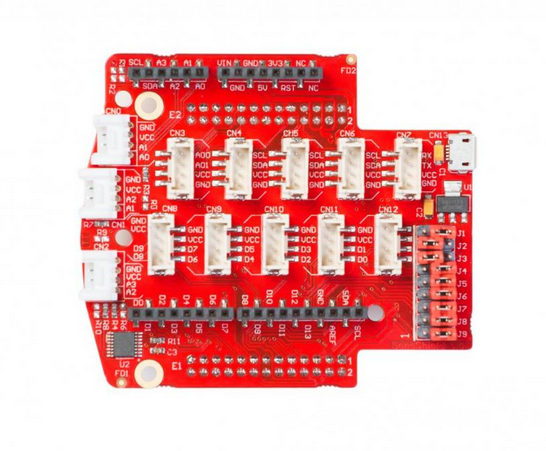 The headers enable you to directly connect a variety of different Arduino Uno shields. There are a wide range of Arduino Uno shields. The Extension module can be powered from the external power supply via a micro USB connector. A set of nine JUMPERS is used for reconnecting certain extension module connectors to different E1 or E2 pins or changing power supply settings. For example: With J1 and J3 you can set the source of VCC- external or from Red Pitaya. A full schematic of the Extension module is available on our web page. The extension module can be purchased from Red Pitaya store. The black connectors on the sides are compatible with Arduino, white connectors on the front provide analog inputs, and there are two rows of gray connectors at the center which provide digital I/O, UART, I2C or analog outputs. On the bottom there are connectors to the Red Pitaya board. This are dedicated connectors compatible with Grove modules. This set of connectors is partially compatible with the Arduino shield connector.